Burial Plot Purchase: May 1889 by George Carter. No Address. 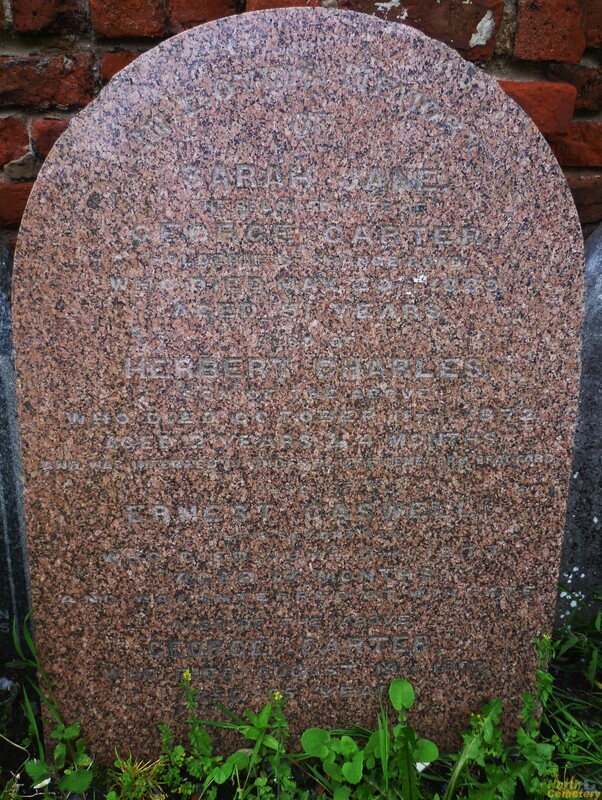 Headstone: A headstone of marble type still exists, but removed. It now stands against the Raby Road boundary wall with many other. Inscription: is carved, worn & reads with difficulty: In loving memory of Sarah Jane the beloved wife of George Carter “Bolderness”Grange Road who died May 20th 1889 aged 51 years, also of Herbert Charles of the above who died October 11th 1872 aged 2 years 4 Months also Ernest Caswell who died June 11th 1872 aged 10 Months and was interred at Wingate, also of the above George Carter who died August 19th 1902 aged 65 years.